Where to begin with this absolute masterpiece by the great James R. Bingham? Wow, what a powerfully designed composition. Practically the whole thing is constructed from basic geometric shapes! But even more delightful is how Bingham lavishes us with classic 50's Polynesian decorative motifs: black lacquered furniture, Bonsai tree table ornament, cane and wicker contempo chair, Tiki mask on a driftwood-patterned wall, Aztec-inspired decorative wall tiles, all set against a stark, white background...Lordy, I'm practically swooning! And don't get me started on Bingham's bolder-than-bold colour scheme: blood-red drop shadows, for gosh sakes! I know I keep saying this was supposed to be a week of just one image per day, but I couldn't resist showing the signature "Bingham Babe" from an accompanying spot. Just look at that white gold hair, those luscious red lips, those Hollywood starlet eyes... all framed in a setting of classic 50's textures and colours. Heaven, I tell you. I've said this before, but I often wonder if two of my favourite comic artists, Steve Ditko and Jim Steranko, didn't both look at Bingham's work and borrow liberally from his style. Whenever I see one of Bingham's detective pieces, I am reminded of aspects of both those other two artists' work. You really need to see this artwork at full size so you can drink the whole thing in. Take a look in my James R. Bingham Flickr set and prepare to be transported. The "Wow Factor" you coined, Leif. So many grown-up and worn-out elder people in my immediate surroundings just have lost that "WOW" ability, the capability to encounter things in a way to leave you almost speechless. Speechless to the extent of an unarticulate "WOW"! I'd wish for them that they might still be amazed, in spite of their odd, eh, their old, worn out age, to still be capable of such an amazement, astonishment, stupefaction, which you, ever young, can bestow on us. obviously there's are similar touches in the uses of geometric designs and heavy shadowing, but not much more. Ditko's extremism is way beyond anything here. Hey Rich, my answer to your comment is simply "WOW". I hope blood red shadows and provocative light golden hair beauties return the "WOW" factor to these "worn out old people" you referred to. They must not be retired illustrators like myself, because virtually all retired illustrators and designers that I know, have very active "WOW" buttons. 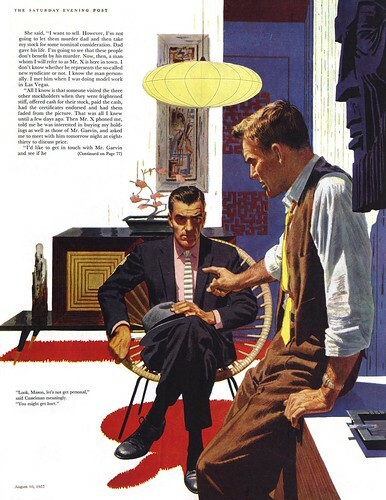 The interiors in many 50's illos were a reflection of the abstract movement that became very chic at that time. Those geometric lines also made a nice design contrast to the figures, as Leif pointed out. Selecting the right props could be as important as selecting the right models. I think it all helps enhance the "WOW" factor. Tom I believe you, what you say about those "very active WOW buttons" in the illustrator community and of course in many others. I may have overstressed a little with the "worn out" expression, because dullness is not confined to elder people. It must have been the WOW stress by looking at this Bingham picture, where I was happy to find the desk below here; to rest my jaw upon. Meanwhile I'm able to retract it again, the speechlessness has gone, and I would just say in general: the more inwardly young people have succeeded to remain, the more WOW buttons remain active. I hear ya Rich. 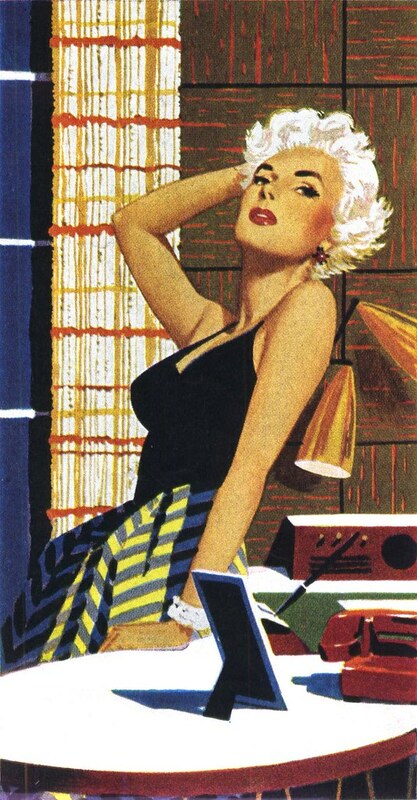 I think it's great that young, old and in between are still "WOWed" by these cool 50's illustrations. Hey, powerful impact is timeless, and these illustrations, as out of date as they are, are actually new and fresh to many. I always enjoy your comments Rich, and keep that "WOW" button close by. Please remember these are copyrighted images from the Curtis Publishing Company. Thanks for pointing that out, anonymous. As an illustrator myself, copyright issues are of tremendous importance to me. To that end, all the scans I present are lo res and identified in my Flickr archives for their source publication, artist responsible, and original publication date. Our purpose here is to inspire and educate, not to infringe or profit from this material... and I am as diligent as possible to make sure others who visit understand how important it is to treat these images with respect for the copyright holder. Wow indeed...I am a late learner but keenly studying illustration for a graphic novel I'm working on. It's set in the world of film and I have a true master to refer to. The man was truly superhuman in his artistic skill.